As creative a poster as the film it promotes. If you have one aim in life it should be to never stop learning. When I was in my early teens I learned that not every movie was a guaranteed source of enjoyment (thanks Tom Cruise and Richard Gere!). When I was in my late teens I learned that even decent mainstream movies often weren’t that interesting to me. Then I learned of other genres and foreign cinema. Wild, Wild West tries so hard to give the appearance of being a crowd-pleaser despite the fact that it has precious little true entertainment value or genuine creativity. Will Smith on the poster is supposed to remedy that for the most part, it seems his films make money regardless of the content. But commercial success be damned, in reality Wild, Wild West is a disaster on every level. An unfunny, uninteresting, altogether unnecessary puff piece with some aspects that border on insulting. The plot in 5 seconds is that US Army Officer James West (Will Smith) is teamed with US Marshall Artemis Gordon (Kevin Kline) under orders from the President of the United States to stop evil bad guys from using a scientifically designed superweapon to overthrow the government. Along the way the duo meet an ‘exotic dancer’ played by Salma Hayek and pursue the bad guy played by Kenneth Branagh. James West is a carefree spirit who shoots first and asks questions later, yapping all the way. He is a super smooth man of action. Artemis Gordon on the other hand is a genius inventor, a pacifist by nature who prefers to use gadgets to win the day. He is a kooky scientist type. No obvious issues at this stage (I applaud the very thought of Salma as a stripper), but let’s address the real issues. Wild, Wild West was advertised as a light comedy, a family friendly romp if you will, so where is the comedy? Artemis’ inventions are supposedly hilarious. At least I think that is what they mean by showing the same shtick ad nauseum throughout the film. Try men dressed as women. Better yet try men dressed as women and looking downright ugly as a result, only every guy in the room finds them irresistible and wants them for himself. Not laughing yet? How about a conversation between a black man and a wheelchair bound man that revolves around constant quips referring to the black man’s ethnic background and the legless man’s disability? How about the bad guy’s choice of transportation – and weaponry – being a giant mechanical spider? No? Then what about his aides all being scantily clad nubile females? A SECOND sequence where a man dresses as a woman, only interrupting the assassination of the President of the United States while he performs an impromptu dance number? No? How about Will Smith doing his hip-hop thing over the closing credits and using his immortal ‘wiki wiki waa’ line? I KNEW that would get you back on side. Wild, Wild West is as brainless as it was profitable, and the thing made 200 Million. I hated this film, like with the abysmal Fled before it, Salma exists only to look purty on the poster and to flash a little PG skin, amazingly despite being one of the hottest women on the planet at the time this atrocious film would’ve been better without her in it. Ditto the ‘human drama’ moments that were so obviously shoehorned in between the lousy jokes and contrived action sequences. In fact I hated this film so much that I retrospectively like Will Smith’s earlier films less as a by-product. And all the while Hudson Hawk is repeatedly brought up as an example of inferior Hollywood excess, compared to Wild, Wild West Hudson Hawk is a Best Picture nominee. I resent the very notion that this was designed with entertainment in mind. A worthy companion to Van Helsing as one of the suckiest big budget films of the last two decades. Final Rating – 3.5 / 10. 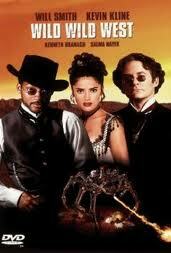 If you learn one thing today, please make it that you should never watch Wild, Wild West. best review so far. loved it, love your work. Cheers Luke for the feedback, I guess you aren’t a Big Will fan either.